Two years on from the 2015–16 surge in migrant and asylum seeker arrivals in Europe, MPI Europe, in cooperation with the U.S. Mission to the European Union, the Canadian Mission to the European Union, and the European Economic and Social Committee, convened a conference to discuss how social innovation can foster the inclusion of refugees into host-country societies. While the social and economic integration of refugees has historically been the domain of governments and nongovernmental organizations, a wide range of nontraditional actors—from tech start-ups and social enterprises to refugee entrepreneurs—have brought both enthusiasm and innovative ideas to the discussion. 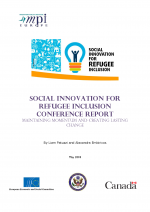 Fostering refugee entrepreneurship as a channel to social and economic integration. Podcasts from the conference and Powerpoint presentations can be found at: www.migrationpolicy.org/si4ri.